A range of vehicles were displayed outside Palfinger Ratcliff’s headquarters for demonstrations. Palfinger Ratcliff has recently marked 50 years in business with an open day, complete with speeches and presentations of its products. 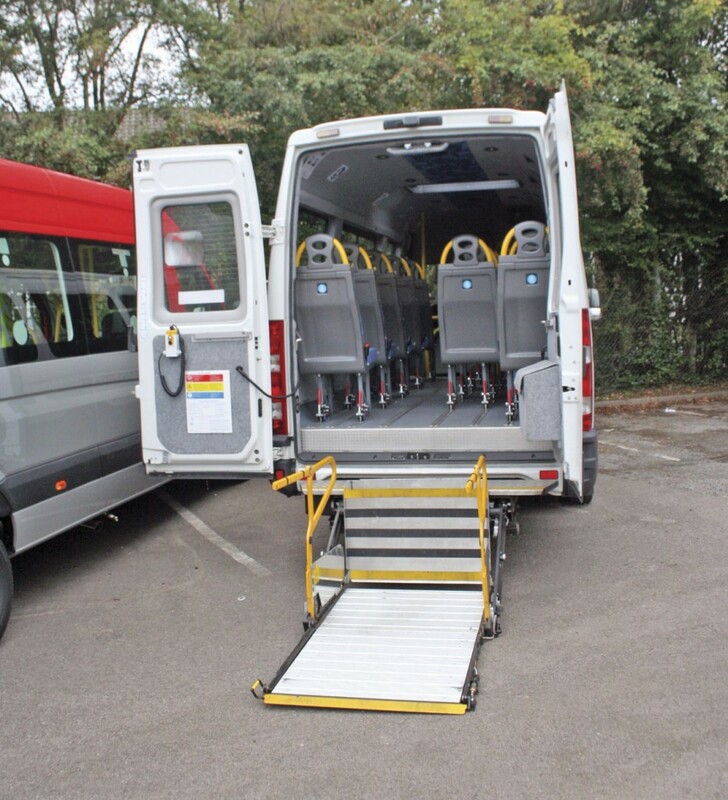 Held at its Welwyn Garden City headquarters, the celebrations comprised of two events, one showcasing its commercial applications and another its passenger lift solutions. The latter was attended by Chris Peat. Arriving at the open day, a change of branding was immediately apparent. This year has seen the company alter its moniker to Palfinger Ratcliff from Ratcliff Palfinger as it was previously known. This name is to change again though, as it is soon to simply be referred to as Palfinger Passenger Lifts. All marketing materials already feature this new name. The rebranding process is taking place worldwide where the Palfinger Group has made acquisitions. 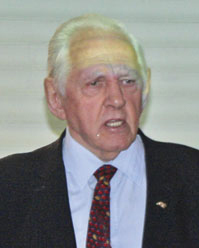 Proceedings got underway with a speech from John Ratcliff, the former Chairman of Palfinger Ratcliff. John said the beginnings of the company can be traced back further than 50 years to 1948, with his father, Ted, who owned a workshop for reconditioning CVs. Ted used another company to recondition the engines of these vehicles, which meant having to queue up with other vehicles waiting for a crane to hoist it out of the truck. To speed this process up, he designed what is thought to be the first tail lift, which allowed the engines to be lowered off the back of a truck meaning they did not have to wait for the crane to pick it off. A manufacturer liked Ted’s idea and decided to take him on, giving John’s father a corner of his workshop to build the lifts in and paying him royalties for their sale. Ted moved to the current Welwyn Garden City site in 1959. It wasn’t until 1964 that he began manufacturing lifts under his own name and ‘from there on he stormed the market’. It invested heavily during this period and in 1966 it launched its first passenger lift. Ted died in 1970, with John taking over the reigns of the family business. One of the company’s major achievements was the acquisition of Burtonwood Engineering, which John described as the ‘midget buying the giant’. 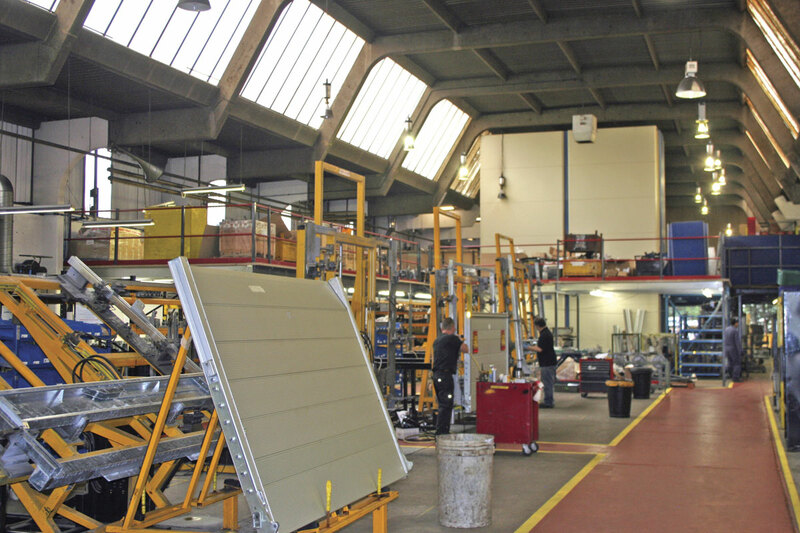 After the acquisition of this company, two further factories were opened in the UK. At the age of 69, after years of success John said ‘God tapped me on the shoulder’ and he knew it was time to move aside and introduce a new management team. In 2005, Ratcliff was brought into Palfinger ownership, another family business. Handing over the ownership gave John more time to focus on his charity efforts. He said he had been surrounded by brilliant people in the company over the years and referring to his life in business, he’d ‘had a wonderful run at it’. Full of praise for Palfinger Ratcliff was the Mayor of Welwyn Hatfield, Cllr Les Page. He said the company is one of the few manufacturing facilities in Hertfordshire and has been contributing to the growth of the community for some time. It has attracted local and international talent. Les praised the company for being aware of the challenges of building staff loyalty. He stressed the business has continually made investments, which have helped secure UK jobs and have contributed to the country’s suppliers, helping support the economy. After the Mayor’s words, Austrian Paralympics gold medal winning para-athlete, Thomas Geierspichler, told the audience his success story. Starting from his time as an Austrian farm boy, he recounted how he became paralysed in a car accident and how this sent him into a spiral of drink and drug abuse. He was then introduced to God by a friend, which inspired him to pull himself out of his woeful situation and become a champion athlete. 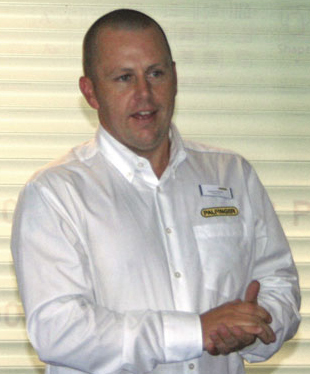 MD of Palfinger Ratcliff, Wayne Harmer, was next to speak, taking as his topic the future of the company. He admitted Thomas was a hard act to follow, but likened running the business to the para-athlete’s endeavour in that they both require passion and determination to proceed and succeed. As the business moves into a new era, Wayne said it will stick to its ethos of ‘Lifetime Excellence’. It aims to adhere to the values of manufacturing products that have an outstanding price-performance ratio, as well as valuing high productivity, ease of use, short downtimes and a closeknit service network. Following Wayne’s speech, attendees were invited to a hog roast lunch. 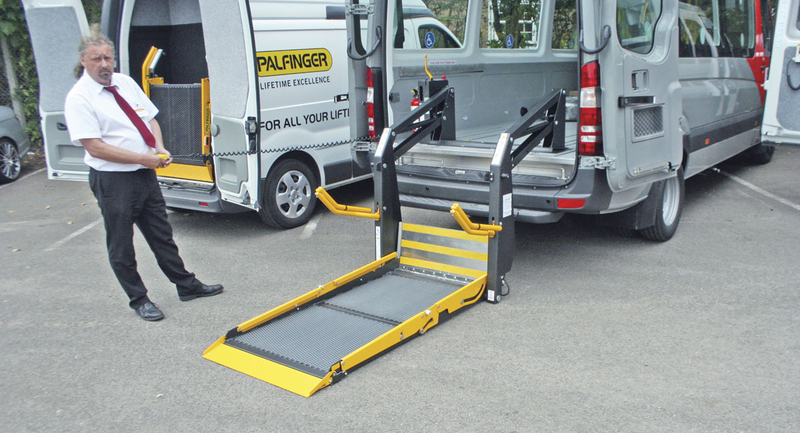 Visitors were also able to take the opportunity to see demonstrations of Palfinger Ratcliff’s products, including its two latest ranges of passenger lifts introduced this year. One of Palfinger Ratcliff’s latest models is the Endurance RUL35 range of cassette lifts. The four variants in this collection include the RUL35A, RUL35AW and RUL35AWL all with lifting capacities of 350kg and the newly released RUL40AWEL with a 400kg lifting capacity. They have platform widths from 725mm to 825mm and depths of 1,200mm to 1,500mm, with cassette depths from 1,090mm to 1,340mm and widths from 900mm to 1,010mm. 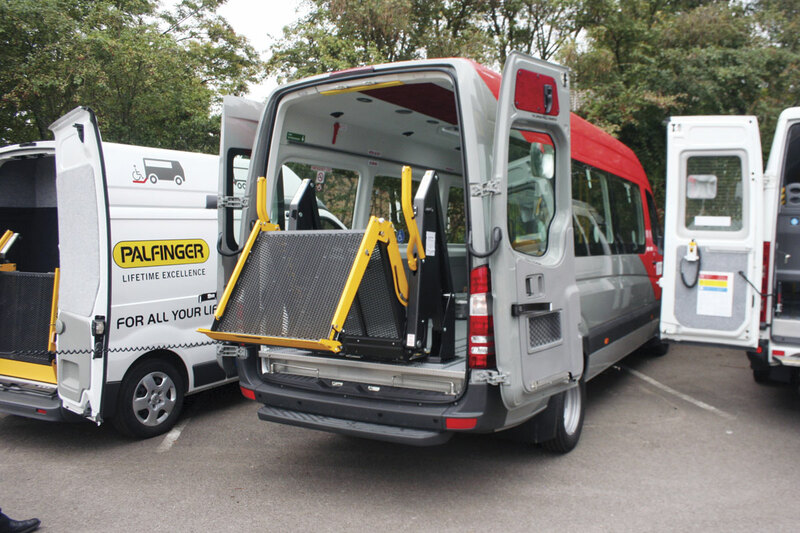 These are available for all vehicles commonly used on minibus conversions, including the Mercedes-Benz Sprinter and Vario, Volkswagen Crafter, Ford Transit, Iveco range, Renault Master, Peugeot Boxer, Fiat Ducato and Citroen Relays and Jumpers. Stowing away in a watertight cassette under the vehicle chassis, it is designed to leave the interior free to allow maximum passenger capacity. According to the company, it can save the space of at least two seats internally and can be installed in a variety of locations on the vehicle. It features an antislip aluminium platform and ramp built for today’s heavier and wider wheelchairs. Stowed inside the vehicle is Palfinger Ratcliff’s Evolution RTP35, which is available with lifting capacities of 350kg to 500kg. The smallest in the range is 1,146mm wide (including power pack) and the largest is 1,333mm. The products are intended to combine the extra space of a big platform with a compact design, taking a small footprint on the vehicle. They feature a high quality steel platform with anti-slip mesh surface and ramp built for the heavier and wider wheelchairs prevalent today. The bridge plate comes with 3M Safety-Walk Anti-Slip Tape as standard. The horizontal fold and vertical split mesh platforms allow the driver to have more visibility to the back doors through the lift. It features an Emergency Hydraulic Safety Valve that prevents dangerous deployment of the lift. It can be fitted on a range of minibus conversions, including Fiats, Fords, Ivecos and Citroens. All Palfinger Ratcliff mobility lifts have a two year warranty. An extensive 24 hour a day, 365 day a year warranty package is available. The company has a ‘highly qualified’ team who work to an estimated time of arrival on site of 60 minutes from time of assignment. Nationwide coverage is achieved through a network of over 30 service agents. Having seen lift demonstrations, attendees were given a tour around the factory. Our tour guide, Andre Prange, explained that the manufacturing plant is being optimised via the implementation of the Palfinger Production System, with an emphasis on increasing its efficiency. One of the areas being addressed is the stock control system. The number of lifts it produces is now being more closely matched with customer demand, with the team focusing on creating as flexible a work line as possible at the site. One of the current drives is to get everything ‘organised’ and ‘visualised’ in the manufacturing site. For instance, it has an outside company galvanise its metal frames and to make this process even easier and facilitate in the 24 hour turnaround of this job, it has introduced a system where they are stored outdoors in separate areas, with one location for pre-galvanised and one for post-galvanised. Visitors were then shown the platform assembly line, which our guide explained is currently going through a process of improvement to increase efficiency and output. Andre said it is ‘not flowing as well as we would like yet, but we will get there with it’. He said the company’s aluminium platforms are the strongest and lightest on the market, they are thin yet ‘very strong’. In the powder coating facility, there was previously a lot of water used. In an effort to make the manufacturing facility more sustainable and environmentally friendly, the company has invested heavily in a water reclamation system that reuses the waste water it produces. The new equipment takes out the phosphate, making it clean and safe for reuse. There are three streams in the assembly phase, with separate departments for LCV, heavy commercial and passenger lift applications. Andre praised the very experienced workers employed here that ‘make sure it works the way they want it to’. Improvements are also being made in this section, with the aim being to reduce the complexity and increase modularity. Again, the goal with this is to achieve better efficiency. One of the biggest projects in the factory has been relocating the spare parts from the company’s site in Garforth near Leeds to the Welwyn plant. This is all part of the target of keeping better stock arrangements to improve its customer offering in line with the Lifetime Excellence promise. To make this relocation possible, a new mezzanine floor has been installed. 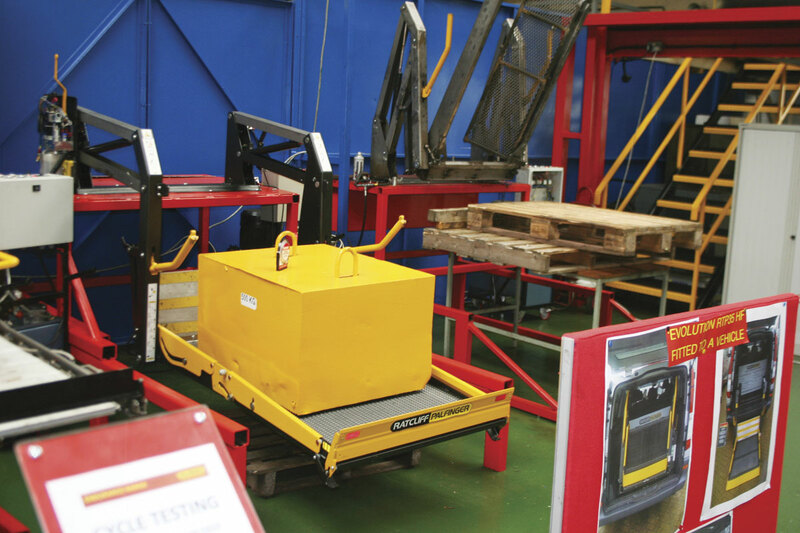 A walk through of the R&D phase of a new Palfinger Ratcliff lift was offered. The initial action is a brainstorming session, where all ideas and suggestions are aired. The best brainwaves are then taken a step further into the product design phase, where the products are drawn on CAD. Once the computer image has been finalised, a metal model is then made, with testing and verification carried out on it. All of the company’s lifts have to be able to carry over double their advertised weight capacity for safety reasons. Once structural tests have been carried out, a more detailed design is put together, putting into place various tolerances and surface finishes. A full production model is then produced. Following this, the company will look into how it will go about manufacturing the equipment. It then goes through a series of approvals before they can then be put on the market. After half a century in business, it is an ideal time for Palfinger Ratcliff to begin a new era. With new products and a rebrand for this year, the company is amply demonstrating how dedicated it is to achieving future successes that will benefit customers and users of its products in a market they have strong claims to having created. This is further supported by the confidence of the new management team, who remain focused on achieving the goal of ‘Lifetime Excellence’.